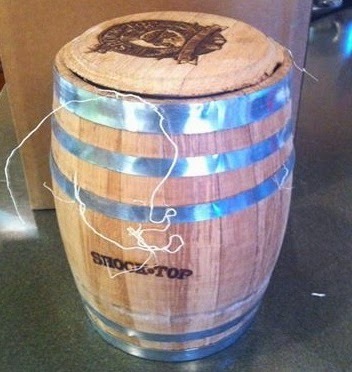 It's not every day you get beer samples packaged in a miniaturized bourbon barrel, but that's how Anheuser Busch (AB) and Weber Shandwick chose to deliver their latest Shock Top offering. The product's launch will be flanked by the brand's first-ever national advertising campaign, which is set to debut this week. You can expect to see as many as four different spots during coverage of NCAA March Madness. 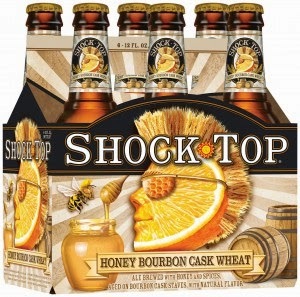 Shock Top Honey Bourbon Cask Wheat is the newest in AB's line of unfiltered Belgian-style witbiers. This time they've added honey as well as caramel malt, and aged the beer on bourbon cask staves. The resulting beer has strong notes of honey and vanilla, along with faint wood tones and a hint of cereal grain. From a critical point of view, many are going to wonder what happened to the bourbon (whose aroma, as it turns out, was missing from the barrel as well). The intensity of the honey and vanilla not only relegates the brew's witbier character to the background, it appears to mask out any hint of bourbon that might be hiding underneath. There's also a lingering sweetness that may sustain a little too long for some, as it seemingly never gets swept away despite bright carbonation. Interestingly, looking back on previous notes, the sweetness aspect is something I've noticed in every other Shock Top version I've tried. Long story short, I see this beer the same way I have previous incarnations of the brand. There's some light complexity that may appeal to BMC drinkers or casual craft beer consumers, but there's not enough here to sway any hard-core beer geeks. It might work as a gateway beer, though, especially for those with a nagging sweet tooth. Shock Top Honey Bourbon Cask Wheat will be available year-round in six and twelve-packs of 12-ounce bottles, as well as on draft. Look for it wherever Shock Top is sold.